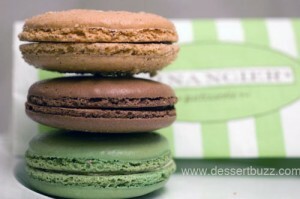 Last week I posted about Panya’s huge $1.50 macarons and noted that they tasted fine but sometimes seemed a bit stale. A friend, who is an accomplished baker, pointed out in the comments that Finacier Patisserie, who generally makes excellent french pastries, also sells large sized macarons for only $2.25, a price well below the NYC average (about $2.25 for a 1.5″ cookie). In an effort to actually provide some useful information to my readers I decided to investigate. My tipster was right. Not only were Financier’s macarons only $2.25 but they were in fact quite large and unlike the Panya macarons, very well made. I tried a chocolate, hazelnut and pistachio. My favorite out of the three was the chocolate since it had the strongest and most distinct flavor. The pistachio also had a nice flavor. The hazelnut didn’t come through as clear to me. (disclosure: I’m allergic to hazelnuts so maybe my sense of smell and taste are affected by that). All three cookies had nice soft exteriors with no “crackle” when bitten. They also had the nice aroma of fresh baked almond flour. 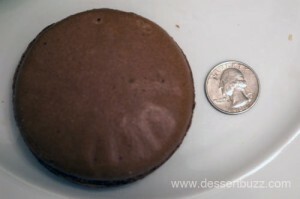 A huge-size chocolate macaron for $2.25! 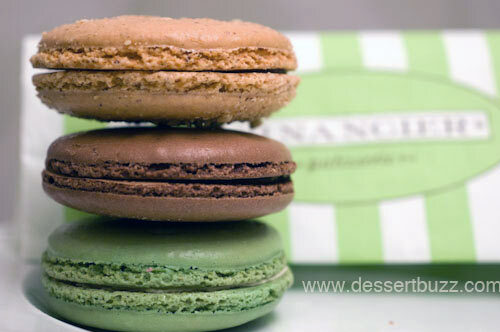 Given the excellent value and the ubiquitousness of Financier’s locations, I have to highly recommend these macarons. Please let me know if you like them if you decide to try them. Recommended: Chocolate and Pistachio macaron ($2.25). 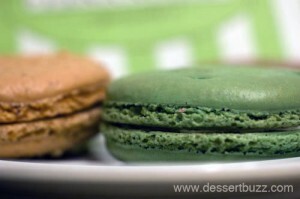 Recent macaron articles: Dessertbuzz’s favorite macarons: Dessert Truck Works. Macarons without bricks and mortar stores: Mad Mac and Macaron Parlour. 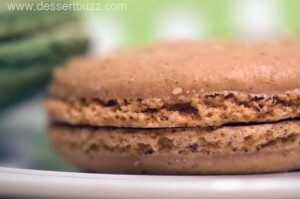 Bouchon has great seasonal macarons like peanut butter and jelly. Don’t forget Macaron Cafe which has very soft, very fresh macarons in midtown. Financier has many locations in NYC – I purchased these at their location on 48th Street between 6th and broadway. Please try the macarons at Bisou Ciao on Stanton Street between Allen & Orchard. You will be in heaven. At Bisou Ciao, the macarons flavors are heavenly: salted caramel is first-rate, so is the rose, orange blossom, citrus, espresso to name a few. The macarons looks like jewels in the glass case. One taste is all that you need. I tried one of these not so long ago and it was shockingly terrible. The macaron tops were doughy and the filling was mediocre at best. Any flavor of almond was lost in flour and dough. For twenty five cents more I would go to Maison de Macaron and get one of their Caramel Fleur de Sel macarons. It’s the perfect size, just enough salt, and still maintains it’s almond flavor. The macarons at Macron Cafe are a bit better with a lighter texture. @Peter, yes the Macaron Cafe macarons are on average slightly better quality (see my review on this site) but again they are $2.25 or 2.50 for the quarter size cookie. Financier’s products are all great…the macaroons are really good and price is amazing. I am glad they are opening more around the city. I love Financier. Some products aren’t great, but most are awesome. I only tried the hazlenut macaron in hazlenut. Very sweet, but very good. Hi i have to disagree about Financier’s macarons. They are not consistent. I purchased two large ones last month and one was stale… not soft at all as a macaroni should be. I’ve never had that with Panya’s which are much better. I have the sweetest friend who has gifted these wonderful macarons to me twice…they are delicious and wonderful and hold up very well….with my husband forgetting to bring them home when dropped at his office. A wonderful treat! Deborah, I’ll have to stop by Financier again soon–thanks for the reminder! For most recent news you have to pay a visit web and on world-wide-web I found this website as a most excellent website for most recent updates. Recently we ordered macarons from Payard for an office party. We have tried all the rest. Payard’s were far superior even to Laduree. Her father is her foundation and she says it will be very hard being out of touch with him for so long while in the house. blonde to fit the image of the American “good girl. you have reached that aim. I am 68 kgs and I want to loose at least 13 kg weight.